Trek to the several different beaches of in the hippie town on Gokarna and spend the night camping at the Gokarna Beach. After an overnight journey from Bangalore, you'll hike all around Gokarna to visit the Belekan beach, Paradise beach, Half Moon beach, Om beach and Kudle beach. At the end of the night, the trek will lead you back to the Gokarna beach, where you'll gather around a crackling bonfire, before spending the night in tents. The next day, you'll also visit the historic Mirjan Fort and the small Vibhooti Falls, before making your way back to Bangalore. Gokarna Beach, located on coastal Karnataka, is a popular destination for travellers from all around the world. The hippie culture of the town, combined with a sprawl of beautiful beaches and historic landmarks, makes for a charming destination for a trek. The beaches of Gokarna, arguably the mainstay of the town, are marked by panoramic views of the Arabian Sea, clean white sand all over the shore, mysterious flea market shops selling all kinds of accessories as well as giant boulders and rocks. 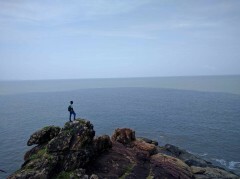 • Trek to all the different beaches at Gokarna. • Catch stunning views of the Arabian Sea. • Go beachside camping at Gokarna. • Visit the Mirjan Fort and Vibhooti Falls. Travellers are required to follow the instructions of the trek leader during this Gokarna Beach trek. 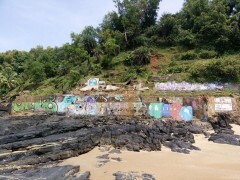 Consumption of alcohol, drugs and tobacco products like cigarettes is strictly prohibited during this Gokarna Beach trek. For cancellations made on or more than 7 days before departure of the Gokarna Beach trek: 95% refund. For cancellations made 3-6 days before departure of the Gokarna Beach trek: 50% refund. For cancellations made less than 3 days before departure of the Gokarna Beach trek: no refund. Travellers can select from three pick-up/drop-off points - Swad-E-Punjab in HSR Layout at 19:00 hrs, New Shanti Sagar Hotel in Domlur at 20:15 hrs and KTM Mekhri Circle in Armane Nagar at 21:30 hrs. Tardiness in arriving at the pick-up point will lead to missing the trek, without any refund. The tour operator takes utmost care to ensure safety of the travellers and shall not be held responsible for any mishap or accident during this Gokarna Beach trek. You'll be picked-up from various locations all around Bangalore in a private, AC Tempo Traveller or mini bus. In the vehicle, you'll meet your trek leader and your fellow travellers. Settle in for an overnight 9-hr journey towards coastal Karnataka. Overnight in transit. You'll arrive at Gokarna early in the morning. Here, you can take some time to freshen up and rest before beginning the trek. Through the course of the day, you'll hike to different beaches and landmarks all around Gokarna. Your destinations include the Belekan beach, Paradise beach, Half Moon beach, Om beach and Kudle beach. At the end of the night, the trek will lead you back to the Gokarna beach, where you'll gather around a crackling bonfire. Overnight in tents at Gokarna beach. 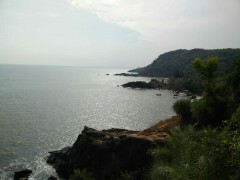 Go trekking at Gokarna and vist several different beaches in the town. Catch a gorgeous sunrise over the ocean, go for a morning hike along the shore and prepare for the day's events. Today, you'll take a bus ride from Gokarna to visit the old Portuguese fort of Mirjan. Post some time spent exploring the fort, you'll visit the limestone waterfalls of Vibhooti. After an hour at the waterfall, you'll board vehicles for the long journey back to Bangalore. Overnight in transit. You'll arrive at Bangalore early in the morning, by 05:00 hrs, subject to traffic conditions. Your trip ends here. Personal expenses such as additional meals or beverages, apparel and gear etc. Arrive at one of the multiple pick-up points located all around Bangalore at the scheduled time. Since no meals are included in today's meal package, you will want to have dinner before reporting to the pick-up point. Make sure to wear comfortable, loose-fitting clothes for the overnight ride to Gokarna Beach and carry some dry snacks for the road. Overnight in tents at Gokarna. 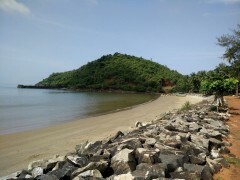 Explore several different beaches of Gokarna. Today's meal package includes breakfast and lunch. Please carry a small box and a spoon to carry your packed lunch. You may have additional meals at your own expense. You'll be accommodated in tents at Gokarna on twin-sharing basis. The campsite will have access to washroom facilities. Visit the Vibhooti Falls and the Mirjan Fort, before beginning the journey back to Bangalore. Make sure that you're carrying a change of dry clothes, since you'll get drenched in the waterfall. Today's meal package includes breakfast only. You may have additional meals at your own expense. You'll spend the night in the vehicle en route to Bangalore. You'll arrive in Bangalore by 05:00 hrs, subject to traffic conditions. Travellers can select from three pick-up/drop-off points - Swad-E-Punjab in HSR Layout at 19:00 hrs, New Shanti Sagar Hotel in Domlur at 20:15 hrs and KTM Mekhri Circle in Armane Nagar at 21:30 hrs. The tour operator will arrange your transport to the start point of the Gokarna Beach trek.